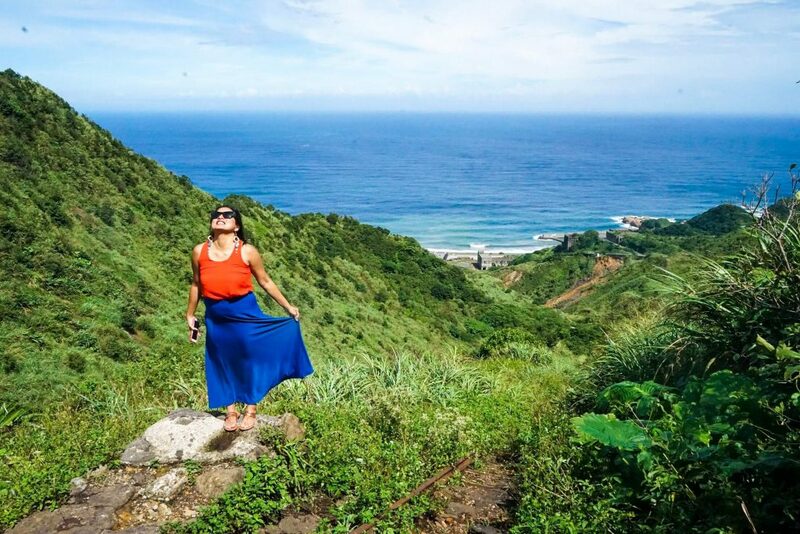 Even the gold and copper deposits depleted, the Northeast of Taiwan still delivers to people precious experience that is truly rare. When searching online for Taiwan day tour packages, “My Taiwan Tour” often comes up. The tour company has good reviews and given that it was a rainy day, we thought that booking a tour here would be our best option. 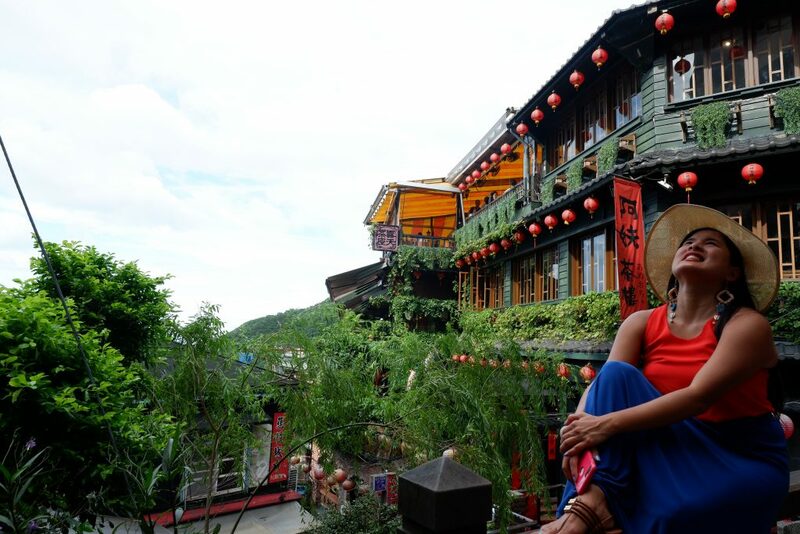 One of the popular day tour packages they offer is the “Jiufen and Pingxi Day Tour” which you may book through this link. After completing your reservation and processing your payment, you’ll immediately receive confirmation through email. Two days prior to your scheduled tour, they will coordinate with you and provide you with specifics of your chosen tour package. When booking “Jiufen and Pingxi Day Tour” package, you may note that it will be an eight-hour tour but no meals are included. Also, the minimum number of guests for this day tour to push through should be 4 but they keep their maximum to 14 people. Our group was composed of five : Lara and I, an Aussie and another Filipino couple ( just by chance). By the way, our Tour guide was Cai. He knows his homeland’s history and was good at speaking English. Cai talked a lot of the history of the place and he helped us in navigating our way through Jiufen, especially cause Lara and I didn’t speak their language. Our first stop was the Ruins of the Thirteen levels or Shuinandong Smelter located at Jinguashi. 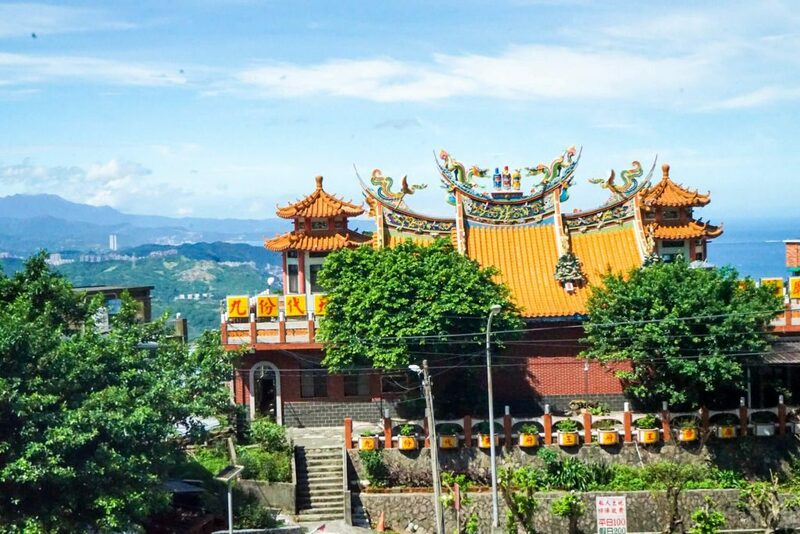 It is only 10 minutes away from Jiufen and a worthwhile place to drop by. The abandoned smelting plant is no longer open for public touring since some parts of its interior have become unstable. Thus, going inside the site was deemed unsafe. Shuinandong Smelter is still instagram-worthy. It reminds me of the Rice Terraces in the Philippines as it was overtaken by nature. Anyway, Shuinandong is one of the historical sites in North Taiwan that reflects the past golden ages of the mining industry in the country. 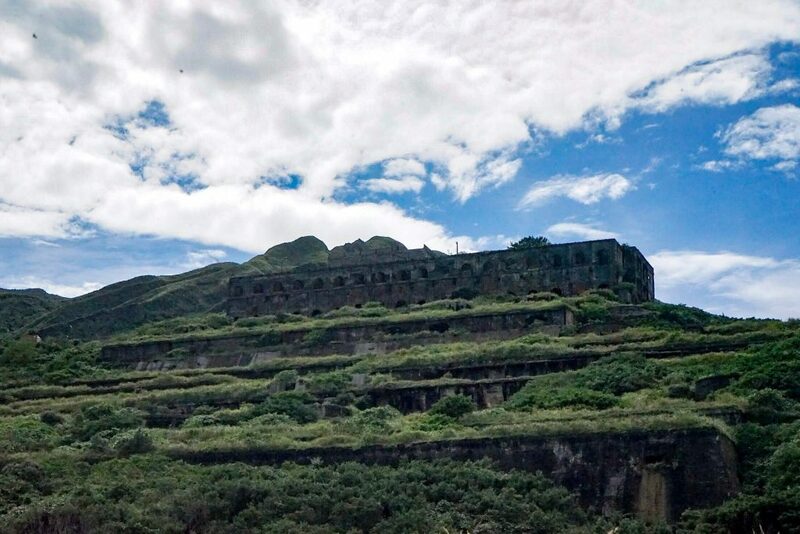 This abandoned establishment was built in 1933 during the Japanese colonial era and thereafter was retained and managed by the “Taiwan Metal Mining Company for the gold and copper ore until the mineral deposits depleted within its vicinity. 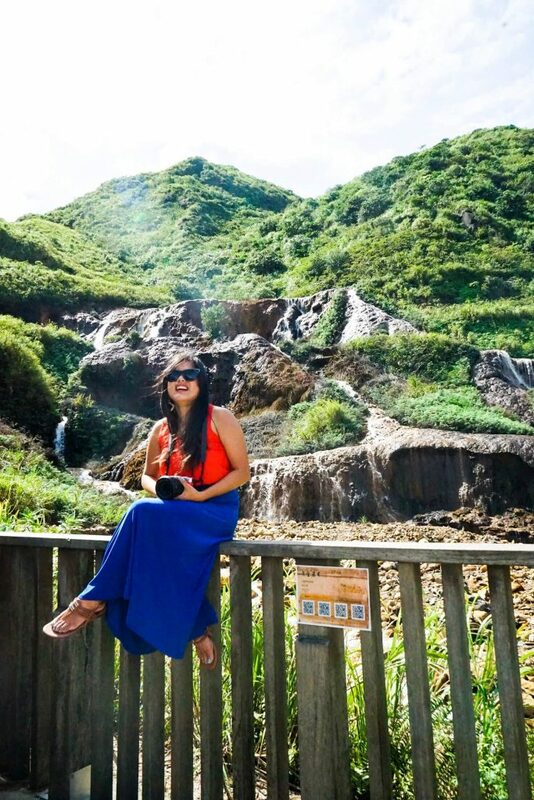 Another stopover along the way going to Juifen are the Golden Waterfall and the stunning view of Yin-yang sea. While Yin-Yang is represented by dark and light swirls in Chinese philosophy, Yin-Yang Sea has color rusty yellow reflection starting from the bay then meets the natural blue color of the sea coming from the open sea. Some of the water in Yin-Yang Sea came from the Golden Waterfall. The Golden Waterfall is not your typical source of fresh waters. Its water was contaminated by the mineral deposits in the area. Despite the contaminated water flowing through the mountain and into the sea, the phenomenon turned out to be something good. 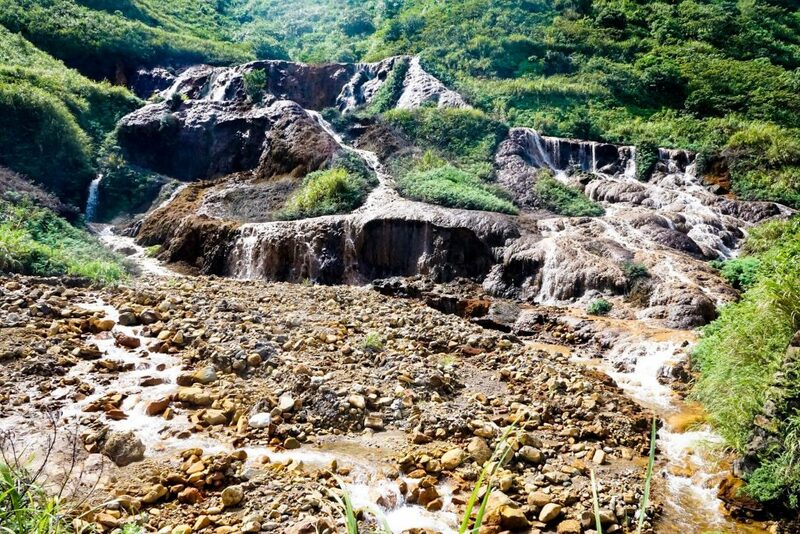 It helped boost tourism in Taiwan by creating two more tourist attractions in Jinguashi. Old Abandoned Railway in Jinguashi has a really good view. 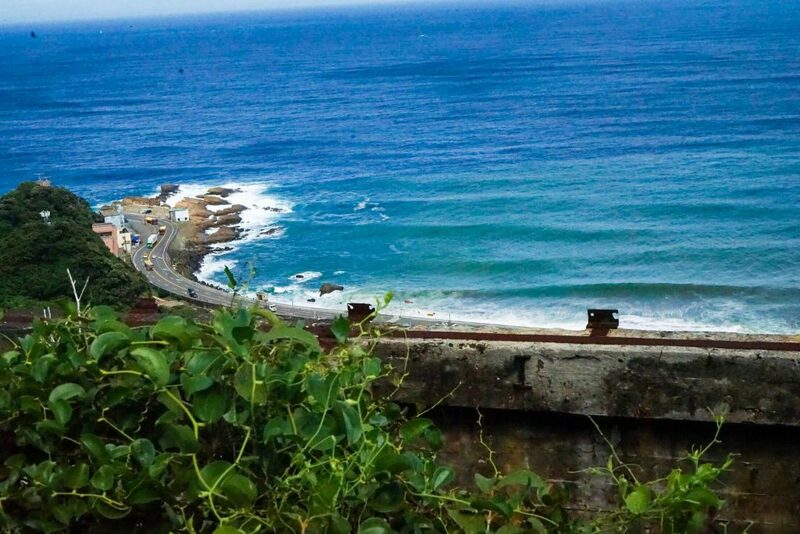 Our tour guide took us to this “secret spot ” where t you can capture the best view and picture of the whole Jinguashi. When we got to Jiufen, Cai asked if we wanted to have lunch together or to go our separate ways. Our group decided to eat together as we all wanted to taste a lot of food. Yes, we ordered, family style. Our guide Cai took us to this restaurant with a good overlooking view of the sea. You need to go through a small tunnel to get there. The restaurant had an awesome view of Yin and Yang sea however, it was a bit costly. 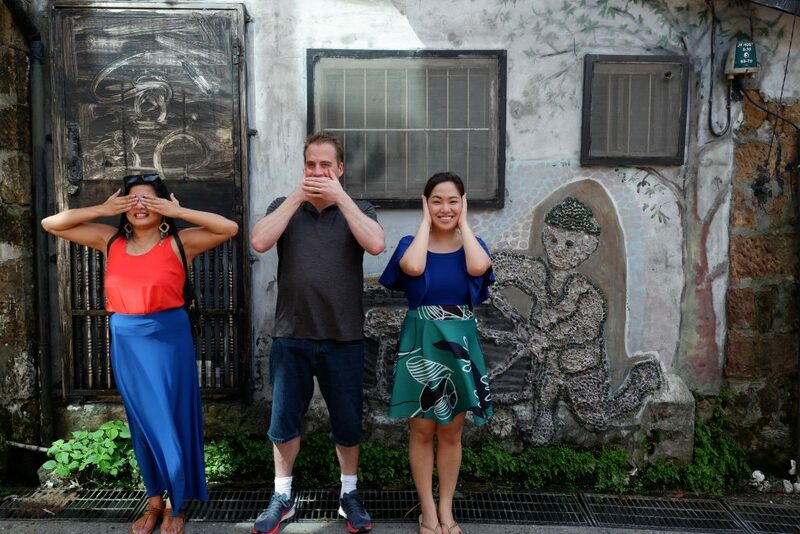 Cai said, JIufen is touristy so prices can be higher. 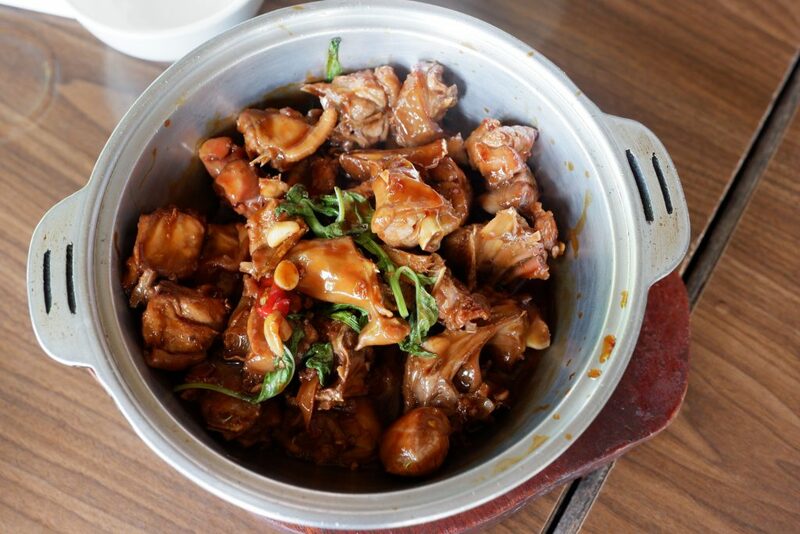 Three Cups Chicken – Basically, a traditional Taiwanese cuisine which got name its name from its sauce primarily made of one cup each of sesame oil, soy sauce and rice wine. Even when we split the bill amongst our group, we still find it quite expensive. All in all, we paid 320 NTD per head. Anyway, it sure was a really pretty restaurant, with good overlooking sea views and great food experience. Cai accompanied us as we wandered around the narrow streets of Jiufen. We came across many souvenir shops, tea shops, cafe, and restaurants. The most alluring stores are definitely the ones selling authentic Jiufen street foods. These include Taro Soup, Peanut Butter Balls, and Beef Noodle soup. 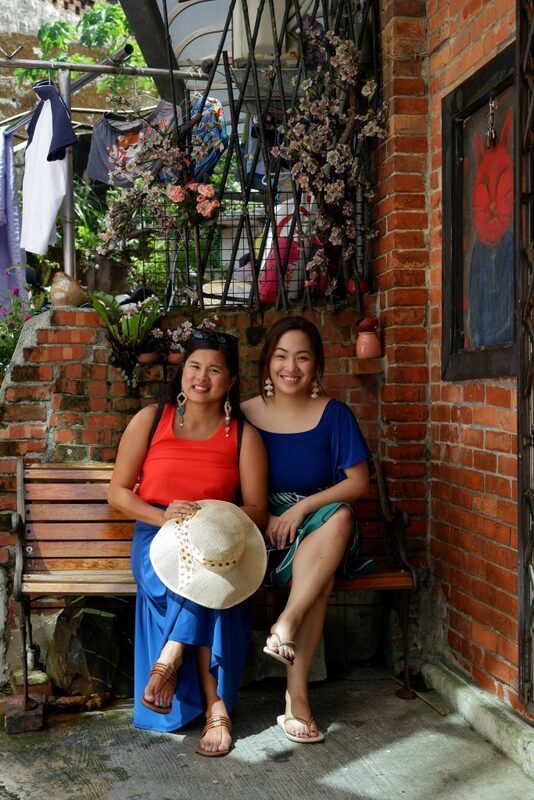 Honestly, Lara and I enjoyed going around Jiufen a lot the first time we went with My Taiwan Tours. We thought that it will be nice to experience the happenings by night too especially since it was highly recommended by our tour guide. So, the next day we went back. 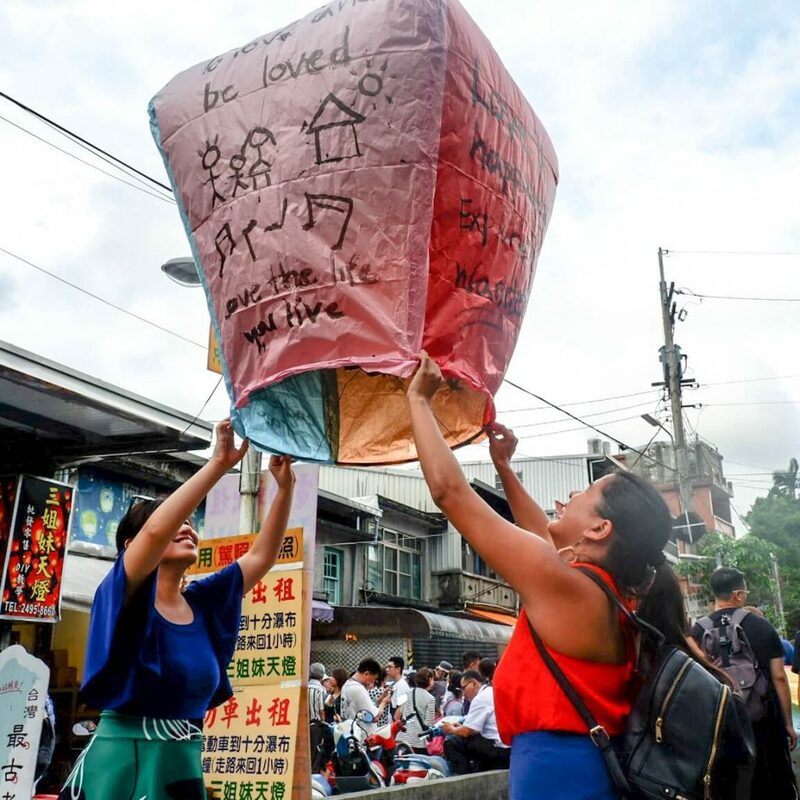 A lot of people go in Pingxi to fly a sky lantern. The activity is done in the middle of the railway. I thought it was already an abandoned railway. I was surprised to see that the railway is still active. There’s nothing to fret about this. The locals are aware of when the train is on the way so they tell everyone to get off the tracks. Be attentive. Whistles signal that you should get out of the tracks. 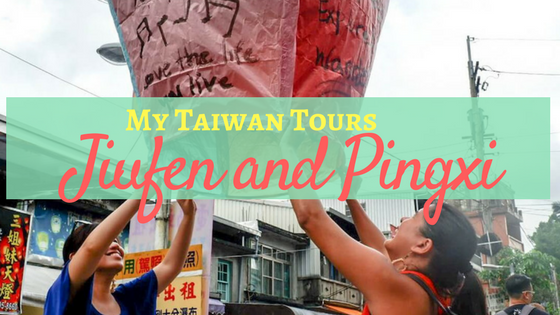 What makes our tour to Pingxi different with My Taiwan Tours. WHile others opt to just buy the lantern, we made our own. Of course, Lara and I weren’t so confident. Arts and Craft isn’t our strongest suit but we were assured that no matter what, our lantern will fly and that they will fix it, if we do it ‘wrong”. Before we started making the sky lantern, the owner of the sky lantern shop did a demo to show us how to do the whole thing. He was really kind to guide us as we work on our lanterns. He just didn’t know how to speak English so our Cai translated everything the whole time. We did one sky lantern with four different colors. Each color represents different aspects of life in which you may want to excel at. I loved the added experience of making our personalized lanterns. We enjoyed writing all our wishes. We were able to pour our hearts out — in a unique way —- it was an experience. Pingxi marked the end of my Jiufen and Pingxi Day Tour with MyTaiwanTour. 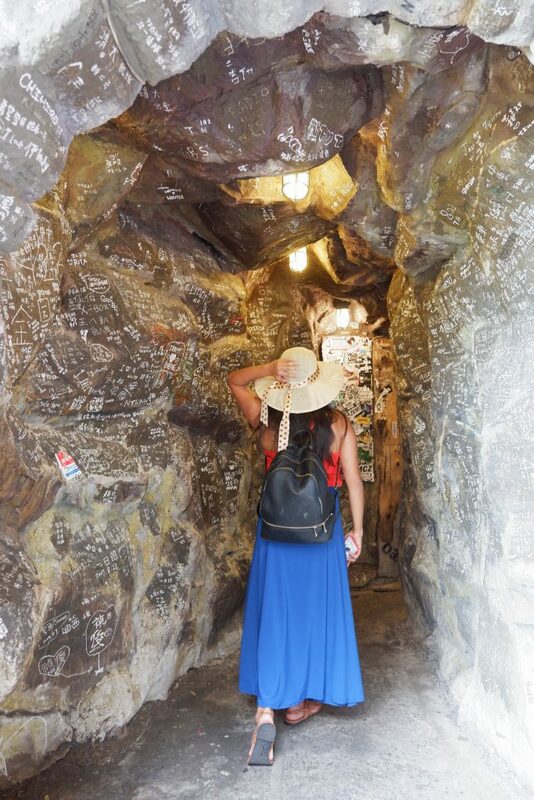 Visiting the Jinguashi allows you to get a good historical insight of the mining industry in Northern Taiwan. 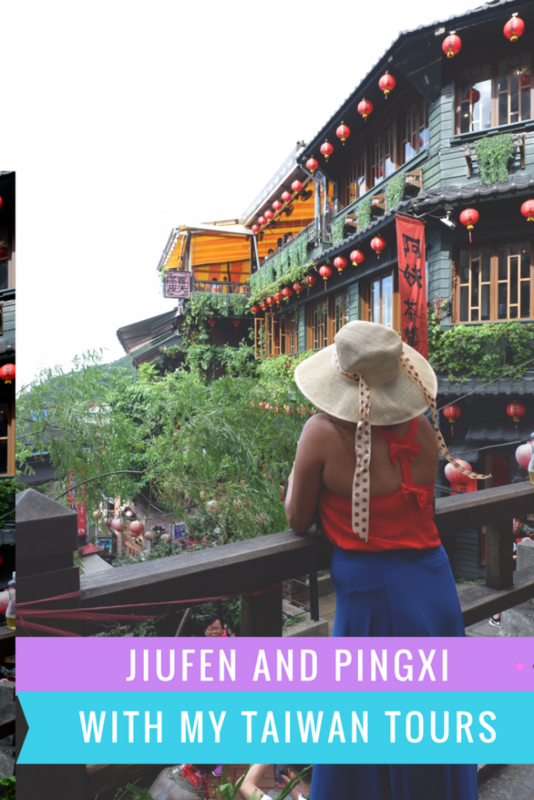 But, my favorite activities were definitely the food trip in Jiufen and making sky lantern in Pingxi. It is really convenient to travel with an English-speaking tour guide to accompany you, although both places are manageable to do on your own, we learned a lot of history about each one because of the guide. Cai also pointed out all the must eat in the city. Plus, at the end of the day, Lara and I were exhausted so we were able to take a good sleep on our way back to the city. Loved that the tour dropped us at our hotel, Amba Ximending. 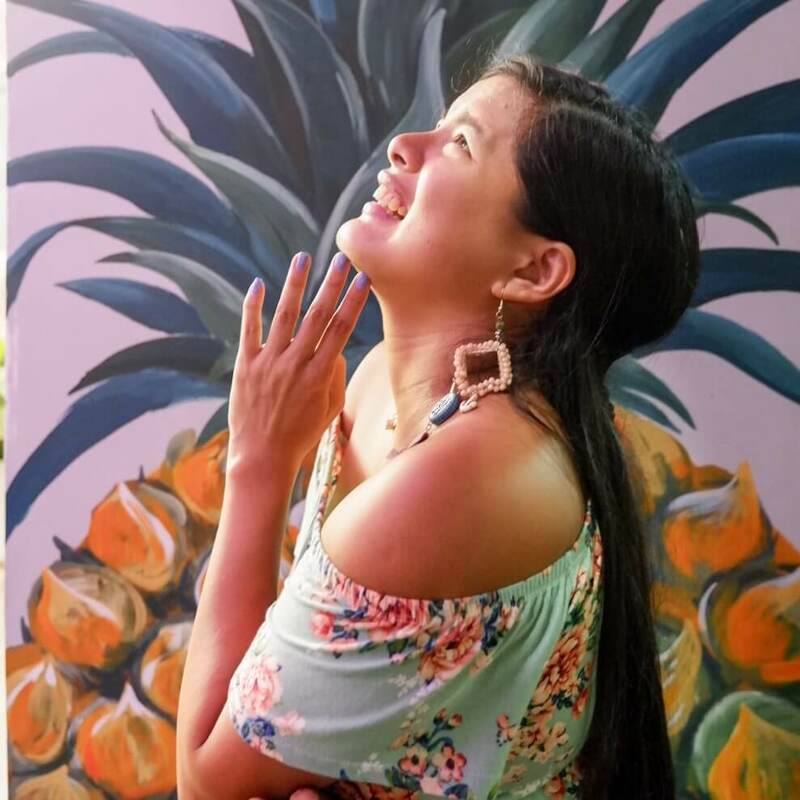 The day tour ends by around 5 PM.So, if you’re still up for a nightlife in Taipei, I’d suggest that you request them to drop you off at Roahe Street Night Market. See also the Must Eat in Raohe Market.